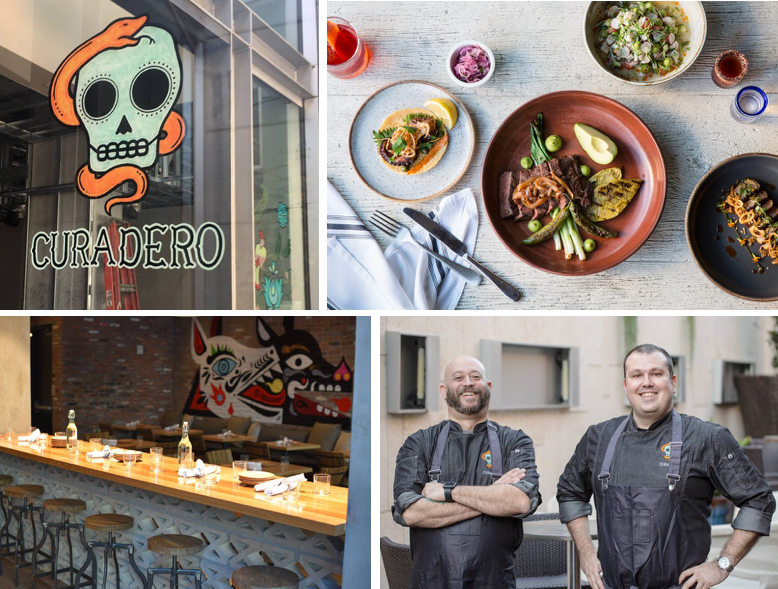 "Soulful" Mexican restaurant Curadero opens today in downtown San Diego, offering a menu of modern coastal Mexican cuisine in the space that previously housed Saltbox in downtown's Hotel Palomar. Curadero was created by award-winning interior architects, Studio Unltd. The interior is a vibrant, space that exudes an alluring south of the border feel, with a nod towards San Diego’s coastal vibe. 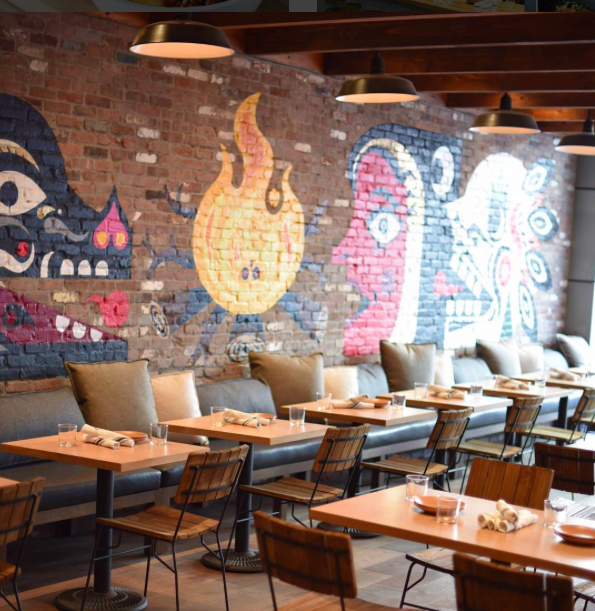 Large, bright murals depicting medicine men by Mexican muralist Neuzz are balanced by beautiful brickwork and rustic textures. Colorful tiles are found throughout, adorning a sit-down crudo bar, as well as Curadero’s cocktail bar. Beautiful, mixed metal lighting further sets the tone, while the open and airy dining room complete the cantina-style vibe that beckons a gathering of family and friends. 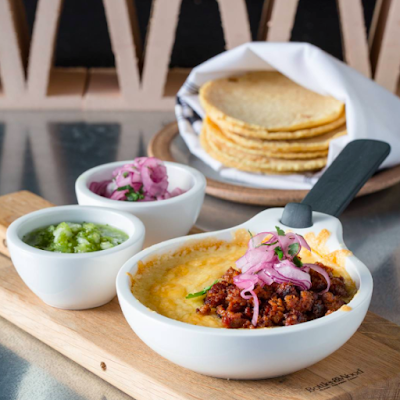 The menus at Curadero from Executive Chef Brad Kraten and Sous Chef Emiliano Najera get to the soul of Mexican cuisine, taking inspiration from traditional, regional dishes from all over Mexico. For dinner, sample something from the Crudo Bar, like the Tiradito de Robalo with local cured chorizo, finger limes, jalapeno and olive oil or Aguachile Verde with shrimp, cucumber, marinated red onions, and lemon oil. Move on to starters like the Pozole with pork broth, hominy, lettuce, radish, oregano and salsa roja, or Mejillones con Birria, or Carlsbad blue mussels in a birria broth with goat crisp and cilantro. Platos Fuertos, larger plates meant to share, dish out braised, grilled and roasted proteins, like grilled and thinly sliced Carne Asada sirloin with chiles toreados, nopal asado, grilled onions and avocado, and Calabaza y Maiz Cazuela with roasted zucchini and corn, grilled onions, confit tomatoes sautéed mushrooms, crema and queso fresco. Curadero also offers a full breakfast and lunch menu. The bar at Curadero houses over 80 premium tequilas and other Mexican spirits, like mezcal, bacanora, and sotol. Guests can indulge in a number of liquid remedies by lead bartender Jade Boyd. Boyd, who concocted a menu to pair with Chef Kraten’s bold food, will utilize ingredients and garnishes that will surprise the eyes as well as the palate. Try the mildly wild and slightly smoky A.K.A Silvestrewith Los Javis Mezcal, sweet vermouth, fresh ginger, grapefruit and lemon juice, Bitterman’s Mole bitters and served with a scorpion lollipop. Or maybe something of the unfamiliar kind with the First Date,made with Por Siempre Sotol, prickly pear, fresh lemon juice, ginger beer, peyshaud’s bitters, and rose water mist. And for something more familiar, try Curadero’s signature Michelada, served with pickled watermelon rind, carrots, and a cricket chile salt rim. Guests can also pick from Baja wines or choose from the collection of bottled and draught Mexican beers. The second-level Arriba Room welcomes late night revelers looking for a space to unwind and enjoy a casual bite or drink. Open Thursday through Saturday from 9pm to 1am, the Arriba Room will serve street tacos from its walk-up taco window, Mexican beer and wine, batched cocktails and house sodas. Head to the game loungeand try your hand at one of the classic arcade games, like Donkey Kong, Ms. Pac-Man, Galaga and Frogger, or challenge friends to a friendly game of foosball or shuffle board. 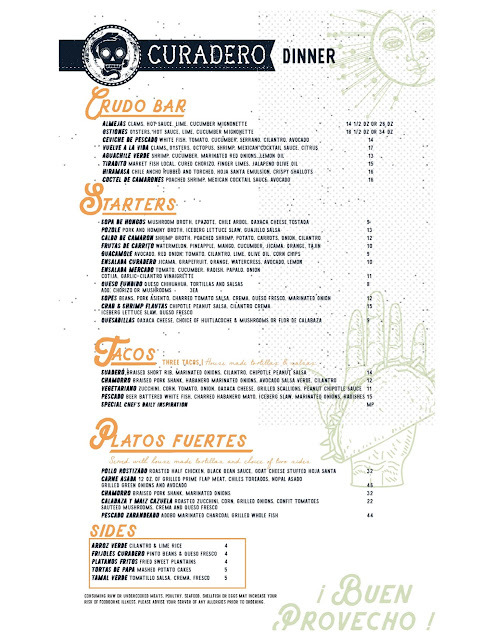 Curadero and the Arriba Room are located at 1047 Fifth Avenue at Hotel Palomar in downtown San Diego. For more information, visit Curadero.com and check out the dinner menu below.